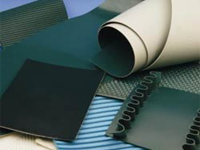 We offer fine quality conveyor belts of the specifications. They are used to handle material transport. We offer the best quality of these belts for stone crushing units. We offer clients high grade quality Conveyor Belt plain which is most renowned for its quality synthetic fibers in rubber industry. Nylon fiber is used mostly for medium, long-distance and heavy-load transportation of materials and also widely used in mining, metallurgical industry and architectural industry and ports. 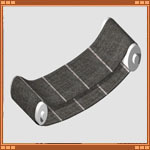 Our company is involved in offering best quality of Conveyor Belt. This Conveyor Belt is extensively used in various suitable industrial and commercial applications. Further, the offered Conveyor Belt is available in different sizes and specifications. These products are highly appreciated amongst our customers due to its hassle free performance. Capable to manufacture different types of wire mesh ranging from 02 to 500 mesh. Optimally utilize the resources to process bulk orders. Continually invest in technology to add on to the growth of the company.